After Friday night’s screening of Harry Potter and the Deathly Hallows Part 1 I have to come clean – My name is Craig Grobler and I am a Muggle. Although I have never read any of J.K Rowling’s novels, I have seen the previous 6 films on the big screen, I can delve into the infinite detail of fantasy film, have a penchant for the mythology of the Roman & Greek gods, can banter film trivia with the best of them, have visited Harry Potter film locations, taken my niece to see one of the scenes of Harry Potter and the Deathly Hallows being filmed, had the good fortune to sit in on a Q&A with Daniel Radcliffe about Harry Potter and the Deathly Hallows, as well as had a glimpse at some early footage way back. Harry Potter learns on his 11th birthday that he is the orphaned son of a powerful witch and wizard and possesses magical powers of his own. At Hogwarts School of Witchcraft and Wizardry, Harry embarks on the adventure of a lifetime, discovering a world of magic and fantasy where he is destined to live. Cars fly, trees fight back and a mysterious elf comes to warn Harry Potter at the start of the second year of his amazing journey into the world of wizardry. This year is a year of adventure and danger! Harry, Ron and Hermione must use all their magical abilities and courage to save Hogwarts! It’s Harry’s third year at Hogwarts, but all is not well with the escaped prisoner, Siruis Black, on the loose! Harry and his friends spend their third year learning how to handle Divination. They also visit the wizarding village of Hogsmeade and the Shrieking Shack, which is considered the most haunted building in Britain. In addition to these new experiences, Harry must overcome the Dementors, outsmart a dangerous werewolf and deal with the truth about Sirius Black. Beset by nightmares that leave his scar hurting more than usual, Harry is all too happy to escape his disturbing dreams by attending the Quidditch World Cup with Ron and Hermione. But something sinister ignites the skies at the Quidditch campsite; the Dark Mark, the sign of the evil Lord Voldemort. Harry longs to get back inside the safe walls of Hogwarts. But things are going to be a little different this year. Dumbledore announces that Hogwarts will host the Triwizard Tournament, one of the most exciting and dangerous of the wizarding community’s magical competitions. One champion will be selected from each of the three largest and most prestigious wizarding schools to compete in a series of life-threatening tasks in pursuit of winning the coveted Triwizard Cup. Harry must overcome a deadly dragon, fierce water demons and an enchanted maze only to find himself in the cruel grasp of He Who Must Not Be Named. Harry returns for his fifth year of study at Hogwarts and discovers that much of the wizarding community has been denied the truth about his recent encounter with the evil Lord Voldemort. Fearing that Hogwarts’ venerable Headmaster, Albus Dumbledore, is lying about Voldemort’s return in order to undermine his power and take his job, the Minister for Magic, Cornelius Fudge, appoints a new Defense against the Dark Arts teacher to keep watch over Dumbledore and the Hogwarts students. But Professor Dolores Umbridge’s Ministry-approved course of defensive magic leaves the young wizards woefully unprepared to defend themselves against the dark forces threatening them and the entire wizarding community, so at the prompting of his friends Hermione and Ron, Harry takes matters into his own hands. Meeting secretly with a small group of students who name themselves “Dumbledore’s Army,” Harry teaches them how to defend themselves against the Dark Arts, preparing the courageous young wizards for the extraordinary battle that lies ahead. When few believe that Lord Voldemort has returned, Harry must secretly train his friends for the wizarding war that lies ahead. Part 1 begins as Harry, Ron and Hermione set out on their perilous mission to track down and destroy the Horcruxes – the keys to Voldemort’s immortality. On their own, without the guidance or protection of their professors, the three friends must now rely on one another more than ever. But there are Dark Forces in their midst that threaten to tear them apart. While waiting for the film to start there was a real buzz of anticipation in the air, discussions were mostly of how close to the book it will it be, Has Harry Potter fallen into the Star Wars template like Lord of the Rings and The Golden Compass (threat arises, it all looks hopeless, previously disparate good guys come together for a final battle with the bad guys, cheers ensue), what are the similarities to Star Wars (released before), Lord of the Rings (published before) and His Dark Materials (published before), Emma Watson’s fab new haircut, Daniel Radcliffe & The Woman in Black and how the Harry Potter books and films have endured so successfully. As Harry Potter Harry Potter And The Deathly Hallows: Part 1 was introduced the large audience went wild, even though it was a mix of bloggers, journos, industry insiders and Potter lovers, it seemed that everyone was a fan. As the titles flew out of the screen and the opening scenes rolled out I couldn’t but feel a tinge of disappointment that The Deathly Hallows was not in 3D. I had quite enjoyed the 3D scene from the IMAX version of The Half-Blood Prince and feel that the magic and wizardry shenanigans of the Harry Potter world lean well to the magic of 3D. I know there is always going to be extended discussion about the novelty of 3D and wish that stalwarts would just get over it already so we could engage with better immersive big screen experiences. Harry Potter And The Deathly Hallows picks up where Harry Potter and the Half-Blood Prince left off. Things are grim; Dumbledore is dead, Voldemort has consolidated his dark alliance, Snape has betrayed everyone, the Ministry of Magic is on the verge of being taken over by Lord Voldemort’s cohorts, Hogwarts is all but lost and Harry, Hermione & Ron are in hiding. We are immediately dropped into Harry & Hermione’s Muggle families being “sent off” for safety, Ron’s family are pure blood so they are actively continuing in the fight against Voldemort. We then get some insight into what Voldemort’s Death Eaters are up to; Voldermort is holding court at the Malfoy Manor with his “trusted” cohorts, all the dark regulars are there; The Malfoys, mad as a march hare Bellatrix Lestrange, Fenrir Greyback, Albert Runcorn, Yaxley, Wormtail, Scabior, Severus Snape, and the other slithering nasty Nagini as well as various Death Eaters and Searchers. They are discussing where and when Harry Potter may be vulnerable to be caught. They seem distrustful of each other and what follows let’s us know even darker than in previous films. The Malfoys are disgraced by their previous failures to destroy Harry Potter. We are also given some insight into the fact that as Voldemort’s wand is made from the same source as Harry’s they can hurt each other but cannot destroy each other. So he is looking to upgrade. At break-neck speed we are back with Harry as the gang re-unite, Harry needs to be transported to a safe house, Mad-Eye” Moody’s overseeing the operation, leading a handful of trusted Potter regulars and almost as quickly we are thrown into a mid air battle between Potter’s allies and Dementors led by Voldemort. And so starts Harry Potter And The Deathly Hallows the seventh and first part of the final chapter in the Harry Potter series. It’s worth noting that J.K. Rowling confirmed at the Premiere of The Deathly Hallows that there may be more books set in the world of wizardry but Harry Potter will not feature as prominently. My history with Potter is well, spotted. I had barely heard of the books when I was dragged off to Harry Potter And The Philosopher’s Stone. I wasn’t wild about it – the good bits reminded me of Neil Gaiman’s The Books of Magic & Terry Gilliam’s great Time Bandits (one of my favourite films of all time) and the rest felt like it was aimed at an audience far younger than me – more Harry’s age and was unable to make the bridge to adult sensibilities. However I have enjoyed each successive tale more, even though some bits are still a little hit or miss for me. I like that the stories became more adult as Harry grows up, increasingly darker and moved into territory that I thought a world of magic and wizardry ought to be. The highlight so far has been Harry Potter and the Half-Blood. Possibly because I saw it at the IMAX & the 3D added some extra magic as well as I saw it with my visiting niece and couldn’t help but love every moment of her excitement of the first UK IMAX screening. Which brings us back to Harry Potter And The Deathly Hallows Part 1. It is a darker, more mature film as Harry, Hermione and Ron deal with the coming of adulthood as well as the dire predicament they are in without the help or guidance of the Hogwarts collective. Although all the regular characters (even Dumbledore via a tiny flashback) are back including a surprise appearance by the house Elf Dobby (last seen in Harry Potter and the Chamber of Secrets) – it has been decided that as much of the book will be in the film as possible ensuring that as the series draws to an end all the characters’ individual stories are resolved properly. This does however mean that there is clearly a lot of ground to be covered, the book has been split across two films and the characters we know and love aren’t really given enough screen time to engage with the audience. Leaving most of the screen time to Harry, Hermione and Ron as they go to ground and have to evade the dark allies, find and destroy the *Horcrux (see, you really do need to re-watch The Half-Blood Prince it’s the reason behind Voldemort’s immortality) while they work out how the items Dumbledore bequeathed can help them (if at all), deal with revelations about Dumbledore’s past, what Voldemort is on a quest for, what and how the Deathly Hallows are tied into all of this and what their next steps are. This time is also used to show that the trio have grown up and are dealing with some adult like issues and each other. It’s unfortunate so much time goes to this part of the story as I felt it made Harry Potter And The Deathly Hallows a film of thirds. 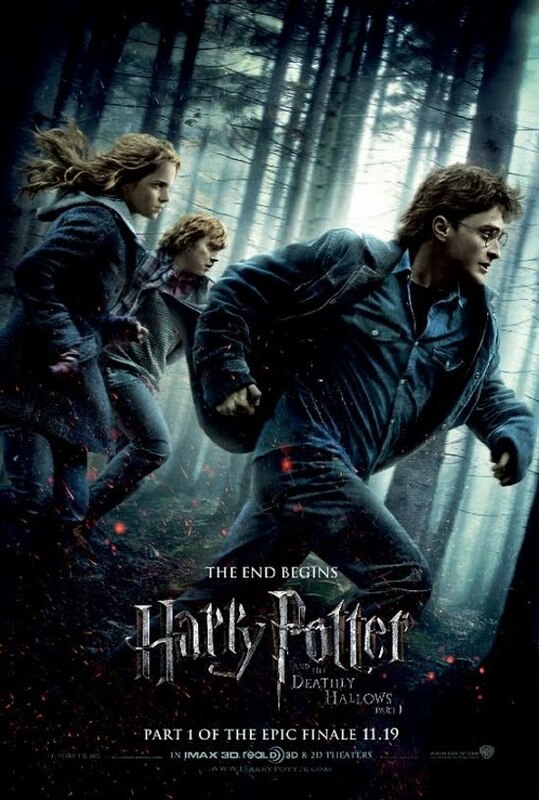 The first third is very fast paced and unless you are up to speed with the events from The Half-Blood Prince you may be left behind, the second much slower and meanders a bit as the now on the run trio try to unravel an increasing dire situation including The Ministry of Magic becoming an Orwellian nightmare and then it picks up again for the final (shorter) third part. Dobby’s brief appearances were the highlights of the film for me – I missed him from the previous films and as the other characters are given so little screen time he comes across as the most human of all the characters and is finally given a chance to shine, with some great dialogue. I’m even smiling as I write this, thinking about Dobby. Maintaining interest in an ongoing series has to be difficult and between JK Rowling’s knack for consistently creating incredibly imaginative characters and filling the world that they live in with richness, combined with exceptional acting and stunning visuals have made the Harry Potter series a real tour de force in the best British tradition. The two young ladies sitting next to me were oohing and ahhing the entire way through the film and had both burst into tears as the end drew near. As the applause died down during the credits, and even though I was feeling a little low I tried to comfort them – they had bounced back enough to tell me Harry Potter And The Deathly Hallows Part 1 was the best film of the series so far as and the closest of any of the films to the book. I’m guessing that if you enjoyed the previous Potter films Harry Potter And The Deathly Hallows Part 1 is going to be a real treat. Unfortunately I’m already waiting for Harry Potter And The Deathly Hallows Part 2 to hopefully see Harry rise up and finally give Voldemort what he deserves for so maliciously turning his entire world up side down.